Here’s a video reporting what researchers at UF have found about the benefits of seaweed in your diet. Anecdotal evidence suggests that the seaweed found off the coast of Florida seems to be particularly beneficial in staving off prostate cancer – the most common cancer in men. Much of what you find on store shelves is imported from Asia which is cheap and often processed. (International shipping puts additional stress on our oceans which negatively impacts sea life.) You’ll find lots of Asian markets with Korean and Japanese snack foods containing dried, salty seaweed. (Kids in these countries often just eat sheets of seaweed as a snack after school!) On the other hand, you could choose from many options available domestically. 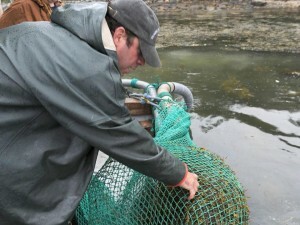 Commercial seaweed cultivation in America is not new and harvesting seaweed is a growing business. Take Maine for example – In 2012 alone, 15 million pounds of seaweed was harvested there, which is double what was harvested in 2007. Unfortunately, the state is now grappling with the issue of how much can be harvested freely from rocks along the coast and how much should remain in order to preserve the local ecosystems. Much of the harvest is dried, milled, and sent to factories to become fertilizer, animal feed, or nutritional supplements. A plan for how to manage “rockweed” collection will be determined by the state legislature this year. However, there are still responsible options for buying your seaweed locally. Maine Coast Sea Vegetables is a company selling “sustainably harvested and certified organic” seaweed products. They are dedicated to the rediscovery of this ancient super food and have been around since 1971. This is the kind of home-grown, sustainable behavior that can be a solution to the problem of over-harvesting along our coastlines. On the Pacific coast, you can visit Rising Tide Sea Vegetables, which harvests their seaweed in environmentally friendly ways. On their FAQ page there is an explanation of how their hand-harvested product is different from machine-harvested, factory seaweed sourced from Asia and shipped over. Although I’m sure there is plenty of hand-harvested seaweed coming from Asian coastal areas too. If you care to support the American Sea Vegetable business, I’d also suggest buying this wonderful product from one of these companies. Enjoy! 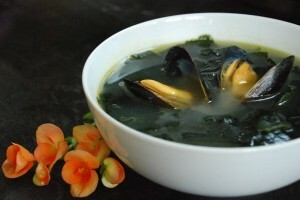 NOTE: The recipe for the seaweed soup pictured above can be found at Korean Bapsang. Another awesome recipe can be found at Dining with Outlaws.